Page visits are great, but really, what is a visit worth if it’s not converting? As marketers, we want our visitors to convert into a paying customers, right? As we like to say here at New Breed, your website should be your best salesperson. A well-designed, optimized site, will not only draw in quality views, but will also convert those views into sales. But the real question is...how can you optimize your website for higher conversion rates? Easy: by building a site to act as a salesperson would. Naturally, a salesperson would provide a potential buyer with the information they want and/or need to make a purchase. You wouldn’t buy a car without knowing gas mileage, or perhaps whether or not it has an adequate number of cup holders, would you? In the absence of a salesperson, it becomes the job of your website to quickly and easily answer the important questions your buyers are asking. To do this, your website must be customized to suit a natural sales funnel. Using different tools and tricks, your site will not only draw in more views, but ultimately, will drive more sales as well. Keep reading to learn how! Using an enhanced platform, like HubSpot’s Content Optimization System (COS), you will have the ability to make your content “smart.” Essentially, you will be able to designate specific content to certain users. “HubSpot adds in smart content, forms and CTAs. Smart content enables you to personalize your pages to the changing needs of each lead and customer” (HubSpot). The reason this is important is because it gives readers the opportunity to progressively grab more content as they go. They’ll begin with an offer from the top of the sales funnel, and may see a call-to-action (discussed below) for a middle of the funnel offer on their sidebar. Once they’ve entered their contact information to download the offer, they’ve shown that they are ready for more content. After which, they will gradually look for more targeted content with each new step – and making the next step readily available using smart content can help to drive a steady process. Basically, what smart content will do, specifically with the HubSpot platform, is deliver content that is personalized to that individual visiting the website. For example, if you have a top-of-funnel offer on your homepage, but that person has already downloaded that piece of content, when they return to your homepage, rather than seeing that same CTA again, they'll actually get a different (middle-of-funnel) offer in its place. You're custom tailoring the content on your site to align with where that particular visitor is in the sales funnel. Pretty powerful, huh? You may be wondering, “What ‘smart’ content should I offer to entice my viewers further down the sales funnel?” – Perhaps the best driver is a premium content offer. A premium content offer (PCO) is an in depth offer ranging from eBooks, guides, whitepapers, webinars, case studies, or any other platform that will provide your viewer with value outside of the typical repertoire of marketing materials (like a brochure / advertisement). By downloading this offer, your viewers will gain something extra, some bit of knowledge that they may not get anywhere else, and most importantly something that brings value into their day. However, to make it a win-win situation and optimize for results, often viewers will fill out a form in order to download or view the premium content offer. In turn, you will be able to designate form fields to learn more about your viewers such as their email address or job title. Using this information, you can further optimize your site for personalized results. Incorporating calls-to-action (CTAs) into your site will really help to drive customers down the sales funnel. CTAs are button or link callouts on web pages that encourage viewers to click for further information. For example, below this blog post you will see a CTA for one of our content offers, "15 Best Practices for Business Blogging." Alternatively, a CTA could simply be linked text that draws attention – I’ve included one below this section for reference. CTAs are meant to draw in the viewer’s attention, and provide “smart” suggestions for more content within your website, encouraging them to click through. The goal is to keep the viewer on your site, looking for more content, rather than having them leave to find more information. As discussed above, CTAs can follow a smart process, and you can recommend different offers depending on a viewer’s position in the sales funnel. This process will flow using past downloads as a reference for a viewer’s interest in your product line. Using “smart” technology, marketers can better personalize e-mail campaigns for subscribers. For instance, smart lists are lists that dynamically change based on certain criteria about a lead. Leads can move on and off these lists depending on how they're interacting with your content, where they are in the sales process, etc. Smart lists enable you to specify exactly which content should go to which list based on behavior they have exhibited. This creates the ability to send highly targeted campaigns. For example, someone comes in and downloads your top of the funnel offer about website design, but then downloads an ebook on SEO. With smart lists, you can move that person onto your SEO list so that you're following up with content that is most relevant to what they're looking for - that middle-of-funnel guide and bottom-of-funnel consultation. Without leveraging this type of technology, it's hard to distinguish where you should be sending your information and more often than not, you'll end up sending someone information that really isn't relevant to them. Not to mention, the e-mails themselves can become more personalized. Nowadays, it’s a best practice to include the recipient's name within the greeting, and have e-mails sent from an e-mail address of a real employee as well. Though this seems like a small step, it can have a great impact on making your viewers feel nurtured throughout the process; being able to respond to an actual person will provide a point of confidence for viewers as they take in the material. Perhaps they’ll have a comment or question (discussed in further detail below), and will be connected to a knowledgeable source for further information on the subject matter. Often times, generic e-mail addresses are not checked for incoming mail, and viewers know this so they will be less likely to engage. The entire reason you’re optimizing your site is for your customers, correct? So why not give them a say? Providing areas for feedback will help make viewers feel more welcome and that they have a voice within your company. Create areas for surveys, provide comment sections on your blog, encourage viewers to send an e-mail; whatever the format, make it clear that feedback is both welcome and encouraged. 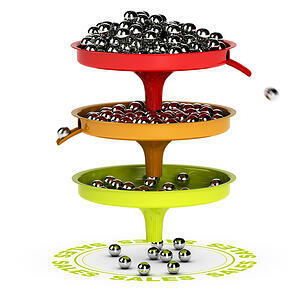 Optimizing your site for conversions will not only increase your lead intake, but will help to drastically boost sales. Since switching to HubSpot’s COS, which provides a myriad of “smart” automation tools, New Breed has seen a tremendous increase in viewership, and more importantly, conversions. Of course, we’ll always rely on human interaction to help lead viewers through our services, but it doesn’t hurt to have an additional resource to provide viewers with more information.